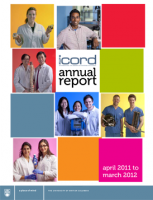 ICORD’s annual report for April 2011 to March 2012 is now available. Download the low-resolution PDF. This blog presents easy-to-understand summaries of published SCI research happening at ICORD and around the world. We are aiming to capture main ideas and points of interest from the research articles. For all the details, please read the full papers. If you have questions or comments about the research, submit them below. SCInfo is an initiative of the Community SCI Resource Centre, a partnership between ICORD, Spinal Cord Injury BC and the Rick Hansen Institute.